Role of counselling in various medical specialties is well know. 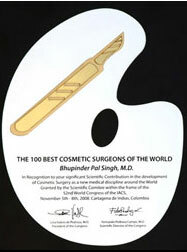 Its need for patient considering cosmetic surgery is of prime importance. Usually patient feel shy in discussing their problem with some one else, hence do not get the right answers and end up in low self esteem. A Counsellor conversant with the problems of cosmetic surgery patients turns out to be a best friend. He not only helps the patient but also the Cosmetic surgeon in making patient happy and satisfied. Counsellor prepares the patient’s mind by imparting useful knowledge on how most of the patients behave in preoperative, per-operative and postoperative phase, and how best to be ready to avoid stress. What you are [REAL SELF] and what you want to be [IDEAL SELF] is the root cause of unrest in mind. Those who are happy with what ever they have, and clearly understand what they want are the CONFIDENT persons. On the contrary, those who see others better than themselves, want to be like them, are people with low self esteem. People who are happy with their self image are more likely to be self confident, effective in work and social situations, and comfortable in their relationships. Those who are dissatisfied tend to be self conscious, inhibited, and less effective in activities. They remain introvert. Counselling helps in the understanding the psychological aspect of the patient. It helps the patient in alleviating their apprehensions and understanding the achievable benefits of cosmetic surgery. Real self to Ideal self transformation is possible with cosmetic surgery; which encourages and promotes a strong, positive self image. Even a small change on the outside can create an extraordinary change inside, allowing an individual's self-confidence to flourish. Changes resulting from cosmetic surgery procedures are usually permanent, it's importance that patient have a clear understanding of how surgery might make you feel long before your appointment is fixed for an cosmetic surgery procedure. Counselling is all about this. You must read details provided here regarding the psychological aspects of the patients considering cosmetic surgery to improve their real self. All issues involved in the cosmetic surgery may not be addressed here considering individual circumstances and their SELF. You are advised to feel free to ask Dr.B.P.Singh MD, FACCS, FAMS, FIACS Board Certified Cosmetic Surgeon, if there is any thing you do not understand about the possible psychological aspects and effects of your planned procedure. Ideal candidates for Cosmetic Surgery. Persons who are honest to themselves are the best candidates for cosmetic surgery. By saying this I mean if they know exactly WHY and WHAT they want out of cosmetic surgery, their goals and objective are well achieved. a. patients with strong self image, but, are bothered by a physical presentation that they will like to change, improve or enhance. Such patients feel good about the results of cosmetic surgery and maintain a positive image about themselves. b. Patients who have a physical defect or flaw that has diminished their self esteem over a period of time. After surgery, these patients take some time to adjust, slowly, but steadily, their confidence is rebuild and strengthened. Some times, a dramatic change is also seen. Cosmetic surgery helps improve YOUR outer self and inner self. But, if you are aiming to improve some one other than your self image about you, after you get cosmetic surgery, you may be disappointed; meaning thereby, surgery on you may not help change what others think about you. You should not go for cosmetic surgery so that others will improve their perception about you. May be, [or may not be] your Friends and near ones will respond positively to your change in appearance and self-confidence, however, you must understand that cosmetic surgery will not cause any dramatic change in people other than YOU. During consultation with Dr.B.P.Singh MD, FACCS, FAMS, FIACS Board Certified Cosmetic Surgeon, candidates considered unsuitable are refused for surgery. 2. Impossible to please patients - those who keep seeking different surgeons opinion willing to listen the answer they want to hear, and hope for cure of a problem which is not primary or physical. 3. Obsessed patients - patient obsessed with a very minor defect and feel once the problem is corrected with cosmetic surgery will dramatically improve his life style. Born perfectionist may be suitable candidates for surgery, so long they are realistic enough to understand that surgical results may not precisely match their expected goals. 4. Mentally ill patients - are unsuitable for cosmetic surgery. 5. Mental Stress or patients in crises- such as those who are going through divorce or the death of the partner, or have job loss. Such patients must be allowed to pass though stressful phase and may be considered when they are adjusted to new situation. Counselling will help them understand that cosmetic surgery will not help in overcoming your crises. Please be honest to yourself and with your surgeon, what you want and what your goals or objective are. Be precise and clear what embarrasses you or what features of a particular part looks awkward to you. You must honestly answer how you feel about your self, how others feel about you and how you wish or prefer to be seen by others. You must feel confident that your problem/s are well understood by the surgeon and you are satisfied by his answers. Do not ask your surgeon to tell you how you should look like. If your objective of surgery are not clearly conveyed to Dr.B.P.Singh MD, FACCS, FAMS, FIACS Board Certified Cosmetic Surgeon, you may not be satisfied with the final outcome…..! One must understand that priorities and feelings about self image changes with the age. Parents should never force kids to undergo surgery so long he/she is prepared. Teenagers or minors should not be taken for surgery unless accompanied by their parents/guardians. Parents may face considerable confusion and anguish in making decisions for their children who are keen for cosmetic surgery procedures to correct a particular feature, or wants to go for a change. Counselling helps them n alleviating their apprehensions. Mental Preparations for Cosmetic Surgery: At the time of surgery patient should be mentally relaxed. If he is undergoing any mental trauma or stress surgery should be postponed. Patient who is to go into surgery feeling preoccupied or pressurized with other matters may face longer and more difficult recovery periods. Dramatic Changes seen in immediate post operative period makes some patient visibly upset. Role of Counsellor during this period of transition is greatly understood. After cosmetic surgery on face, nose, eyelids, chin or lips etc there appears swelling which stay for first 2-3 days. Some times patients gives a frightened and scary look. He/she may feel depressed - why had they undergone surgery? Counselling preoperatively is important to prepare the patient for this change, and post operatively to relax them and make them understand that your desired outcome of cosmetic surgery is shortly to be seen, as told to you by the surgeon before hand. Let the swelling/ bruising pass away. Aesthetic Breast Surgery procedures give immediate dramatic changes in your body shape. Your redefined body image may seem somewhat unfamiliar. It may take some time to adjust for this redefined body image as your own reflection. Reaction of patient to Liposuction done on a larger area is usually of the feeling of 'why I got this unnecessary surgery' or feeling of unhappiness, 'when I will see my cherished / desired figure'. Expression of dissatisfaction and doubt is commonly observed that immediate reduction is not appreciated. Patient should be better prepared preoperatively for the post operative swelling and bruising. Reassurance that "Yes you have reduced"; usually helps the patient to overcome this transient phase. Use of pressure garment should be understood by the patient before surgery. Physical and mental support during post operative phase is essential . Even very confident, very independent and bold looking patient also need some emotional support. You must understand and remember that during first week of recovery some days you will feel	depressed and look swollen, bruised, unhappy and unpleasant. Carefully, you must select a support person who will be just that 'SUPPORTIVE'. Very gently and graciously decline offers of help from those who may be critical of your decision to have surgery or may be overly troubled by your temporarily bruised and swollen appearance. Do keep in mind that it is not unusual for a good well meaning friend or relative to say 'I liked the way you were before, or 'you did not really need surgery'. Feeling of regret or self-doubt, particularly during early recovery period may appear after such comments. You must rely on your Surgeon, Counsellor and your support person to help you through these difficult times. Try to talk to your self on the reasons you decided for cosmetic surgery in its first place. How To Deal With Post Operative Depression Most patients experience mild feeling of unhappiness after surgery. However for some this may be severe. Post operative letdowns usually sets in about three days after surgery, at a point when you may be regaining some of your physical stamina, but your post operative appearance has not yet begun to improve. It may last few days to few weeks. This emotional let down may be caused by stress, exhaustion, metabolic changes, or the frustration of waiting for the result to appear. Depression may be especially stressful for patients undergoing staged procedures. They must be taught to cope up with an unfinished transient image until the final stage of recovery is complete. Patient who are already suffering from depression or who had history of depression before surgery, are more prone for post operative depression. You must discuss in detail with cosmetic surgeon what to expect in the post operative period. One must understand that depression is, most of the times, lifted naturally; and/or by engaging your mind elsewhere like exercise, sports, social activity, outing and back to work. Reactions and comments are uninvited but pour in automatically. Most of the family members and friends will react 'NOT POSITIVLY'. Pure cosmetic surgery is quite often criticized for being foolish or frivolous. You must be ready for some surprised or disapproving glances. Your improved appearance will not be digested by your close ones who will feel threatened and jealous; hence NEGATIVE remarks, reactions and responses. Mostly, your best reply to them is "This is what I needed, I did for myself, and, I am happy with my results". If you feel happy, remember it is indeed, the success of you procedure. You must…FEEL POSITIVE…Think POSITIVE…………...ACT POSITIVE.